Harris, H., Yancey, G., & Myers, D., Deimler, J., Walden, D. (2017). Ethical integration of faith and practice in social work field education: A multi-year exploration in one program. Religions, 8(9), 177. DOI: 10.3390/rel/8090177. Harris, H., & Ellor, J. W. (2016). Lessons from the vertical limit: Valuing older adults. Journal of Gerontology & Geriatric Research, 5(6), DOI: 10.4172/2167-7182.1000364. Harris, H., Rogers, R., & Singletary, J. (2016). Competency-based education and Shared academic freedom for transformational education. European Journal of Educational Sciences, 3(3). Blinka, D., & Harris, H. W. (2016). Moral injury in warriors and veterans: The challenge to social work. Social Work & Christianity: An International Journal, 43(3), 7-28. Harris, H. (2015). Much to do about protest: The Keith-Lucas theory for mourning. Social Work & Christianity: An International Journal, 42(4), 413-429. Harris, H., Lee, C., & Yancey, G. (2015). Cognition in adult bereavement: Preliminary findings from five hospice bereavement focus groups. Journal of Social Work in End-of-Life and Palliative Care. Harris, H. (2015). Much to do about protest: the Keith-Lucas theory for mourning. Social Justice & Christianity: An International Journal,42 (4), 413-429. Helen Harris came to Waco to begin the first hospice in Waco. She has served as a social worker and bereavement coordinator for Hillcrest Community Hospice, where she was the first director of the program. Since coming to Baylor in 1997, she has continued to work with hospice by volunteering with Providence Hospice and by providing volunteer training for several area hospices. She is a member of the National Association of Social Workers (NASW), North American Association of Christians in Social Work (NACSW), the Military Child Education Coalition, the National Alliance for Grieving Children, and the Association for Death Education. 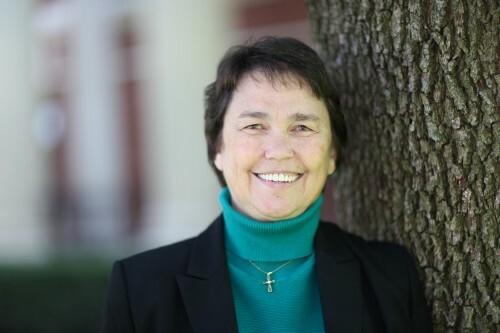 Dr. Harris was honored as a "Woman of Distinction" by Girl Scouts of America, and in 2013, was named Outstanding Faculty: Lecturer for Baylor University. She is also a Faculty Fellow for the University and Academy of Teaching of Learning. Dr. Harris served as a social worker at the Methodist Children's Home and at South Texas Children's Home, where she developed the first independent living program and directed the foster care program. Before joining the School of Social Work faculty, she taught adjunctively for six years in Baylor's Health Education Department. She is married to Don Harris; they are the parents of Daniel and Beth. Is Houston Right for You? What is Congregational Social Work?